The Atlas V rocket carrying my name to the moon became visible in a clearing for only a few seconds. This is tightly cropped so you can actually see it. I've pledged never to miss photographing another rocket launch as long as I'm a resident of the Space Coast. Thursday's liftoff of an Atlas V with two NASA lunar explorers presented more of a problem than usual, though. In a configuration without solid rocket boosters, the Atlas V leaves only a faint smoke trail, and the flame itself is minimal. Also, I was at work in Melbourne, about 30 miles south of Cape Canaveral Air Force Station. That made for little to actually photograph when the weather cleared for liftoff at 5:32 p.m. 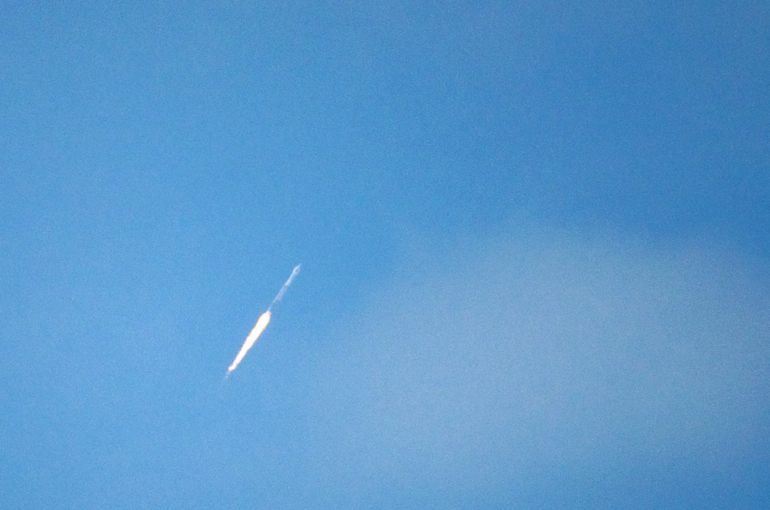 The rocket was visible only at the horizon (left) and for a short period when it appeared in a blue break in the otherwise cloudy skies over Brevard County. Though they are poor photos, they are proof that I did not miss the launch. Not that I would have considered skipping it anyway: This one was extra special. In addition to returning NASA to the moon for the first time in a decade, the rocket was carrying the Lunar Reconnaissance Orbiter, which holds the name of yours truly. I entered it precisely one year ago today (June 18, 2008) in NASA's Send Your Name to the Moon Project (for proof, click here). That's more than a coincidence; that's fate. I was meant to go to the moon - along with the 1.6 million other people who signed up, according to NASA. 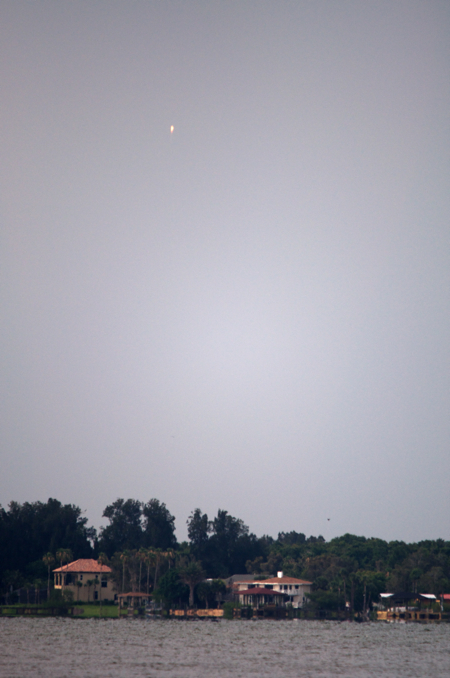 Left: Houses along the shore of the Indian River on southern Merritt Island provide the foreground, and the faraway Atlas V is seen only as a tiny speck of fire as it ascends through the hazy Florida air.